Baffling Bill blends the perfect mix of amazing sleight of hand, comedy, and audience interaction to make your holiday party a success! "This year, our company's holiday party was extraordinary because of you and your magical talent! Every guest in attendance was absolutely enthralled with your magic tricks, not to mention your endearing personality, and your adorable little bunny, Gus. The holidays are always special, and a party is always fun, but improving on a holiday party is hard to do--and you did it! Thanks for making our corporate party such a smash hit! We look forward to seeing you at our family Christmas party on the 19th." "Bill recently was the entertainment at our client gold outing. We had a collection of 30+ guys. Everyone knows after a day on the golf course 30+ golfers can be a difficult group to entertain, but Bill pulled it off. 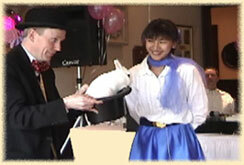 He had the group both amazed and laughing with the help of his rabbit Gus. If you are looking for quality entertainment, you couldn't do any better than Baffling Bill." "I highliy recommend Baffling Bill's program as one that offers high quality entertainment." Closeup, interactive magic: perfect for cocktail hour, dinner, or after dinner. Thirty minute stand-up show includes magic, comedy, and audience participation. 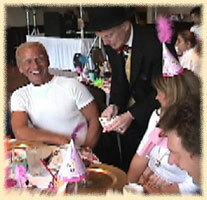 With our twenty years of experience, Baffling Bill is the first choice magician for corporate parties. 100% satasfaction guaranteed. Now booking. Please Contact Us.